When Hurricane Sandy hit in 2012, it killed 44 people and cost New York City $19 billion in damages and lost income. If a similar storm struck in 2050, when the city's economy would be larger, insurance company Swiss Re estimates damages could top $90 billion. It's against this backdrop -- along with steadily rising global temperatures and sea levels -- that the city is preparing for the next big weather event. To keep the water out, New York will soon begin planting beds of oysters and other shellfish offshore. The idea is to create breakwaters that will diminish wave intensity. Flood protection walls are also planned around parts of lower Manhattan. 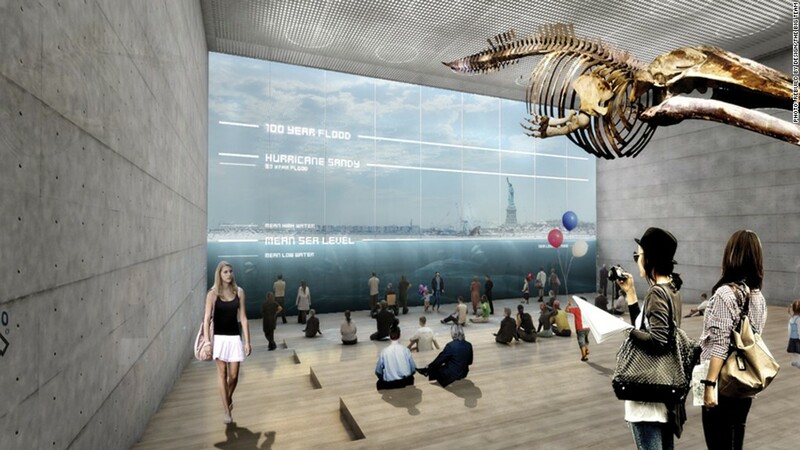 Some ideas include giant flaps that extend down from a highway on the east side in the event of a storm, as well as a "reverse aquarium," seen here, at the island's tip, where a building doubles as a storm wall -- its glass base serving as a window into New York Harbor.